As most readers know, the old Easter Vigil of the Roman Rite underwent a series of reforms beginning in 1951 and continuing until the introduction of the revised Holy Week Rite of Pope Pius XII in the spring of 1956. The Dominicans imitated as much as possible these changes until we produced a new Vigil of our own, one that went into effect at Easter 1957, a year after the Roman Rite. Readers who know the Vigil of the 1962 Roman Missal would find that in use by Dominicans from 1957 onward virtually identical to it, so I am not going to describe it. But as our older liturgy is quite different and of historical interest; thus this post. Following the medieval practice of Saturday afternoon celebration of the Easter Vigil, the Dominican Vigil began after the singing of None. In the modern period, when the Vigil had migrated to Saturday morning, this meant that Matins and the four Little Hours of Holy Saturday were sung back-to-back in the morning so that the Vigil itself could begin before 9:00 a.m. One of the first effects of Pope Pius XII's period of experimentation after 1951 was that in some houses the Little Hours of Holy Saturday were restored to their normal times and the Vigil was celebrated in the later afternoon, but this was by no means the universal practice. Morning celebration continued in many places until 1957. The old Dominican Vigil began with the Blessing of the New Fire. The prior or other priest celebrant, in purple cope, standing before the high altar, blessed lighted coals in a small metal dish held by the sacristan. The coals had been lighted without any special ceremony in the sacristry before the service. The deacon held the missal. The blessing prayer Domine sancte Pater was short and merely recited, not sung. A small candle was then lighted from these coals, but they were kept in the presbytery until the lighting of the church lamps, so that they could be used to relight the Easter Candle should a draft put it out. The deacon received the prior's blessing, gave the subdeacon the missal and placed himself to the subdeacon's left, which was the Gospel side, as all were facing the altar. The two acolytes with unlighted candles flanked the deacon and subdeacon. The prior took his place at the Epistle side of the altar, as he did for the singing of the Gospel at Solemn Mass. The Deacon then sang the Exultet, for which Dominicans have a tone somewhat different from the Roman and which differs in a number of places from the Roman text. Although in modern times Dominicans used Easter Candles of conventional size, as late as the 1800s we often used a very large Easter Candle, much taller than those in use today. Our Province archives have pictures from the 1850s of one of these candles at our old priory church in Benicia California. I will try to get a scan of it. Dominicans did not use a three-branch holder for the Easter Fire and there was no chantning of Lumen Christi. In many priories the ancient practice of the "Easter Card" (Cartula Paschalis) was maintained into the last century. This was tacked to the candle in place of the modern practice of lettering on the candle. The card gave the year of the Lord, the years since the foundation of the Order, Years since the death of St. Dominic, the Epact, the Dominical Letter, and the Indiction. When the deacon reached the words In huius igitur noctis, he inserted the first grain of incense into the candle; at the words Rutilans ignis accendit, he lit the Paschal Candle. The server holding the other four grains of incense then inserted them as the deacon continued to sing the Blessing. These acts would have required use of a ladder in the old days. As the deacon sang Qui licit sit divisus in partes, the two acolytes' candles were lighted, and then, at Pretiosae huius lampadis, the church lamps. When the Exultet was finished, the ministers returned to the sacristy, put on white Mass vestments and returned to the altar. There they bowed and went to be seated for the readings, without any other ceremony. During this one Mass of the year, the acolyte's candles were not snuffed when not in use, but allowed to burn continuously. A lector in surplice then sang the four readings of the Vigil. These were Gen. 1-2; Ex. 14-15; Is. 4; and Is. 54-55. In the thirteenth-century the number of readings at the vigil varied widely: from 4 to 18. The Dominican shorter version was found widely in use in Italy. There is actually nothing unusual about it. So, I do not believe that the Dominican was a special model for the post-1955 Roman revision of the Vigil--the readings do not match. I would think that the Roman model was one of the shorter Italian (Roman) uses from the middle ages. A Tract and Collect followed each reading except that from Genesis, which had only a Collect. The second reading from Isaiah had two collects, one before and one after the Tract Sicut Cervus. Two chanters wearing surplices in medio chori then lead the community in singing the Litany of the Saints in its Dominican form. When the choir had sung the last Agnus Dei of the Litany, the choir began the Easter Kyrie and the major ministers approached the altar for the Prayers at the Foot of the Altar. The priest then intoned at the center of the altar, the Gloria in the solemn tone (very similar to that of Roman Mass IV). As it was intoned, the organ played for the first time since the beginning of Lent, the church bells were rung for the first time since Holy Thursday, and the friars took off their black cappas to reveal their white habits. The subdeacon then sang the Epistle from Colossians 3. The Dominican way of singing the Easter Gospel Alleluia differs from the common Roman form, with its three repetitions of the Alleluia and cantors raising each intonation. To the right you can see the Easter Alleluia according to the Domincan chant, the melody of which differs a bit from the common Roman form. You can also see how it is sung. Two cantors in medio chori intone it and the friars all rise. The community then joins in on the short melisma at the end: as indicated by the double bar. Note that this use of the double bar in Dominican notation functions as does the asterisk in Solesmes notation. Then the entire Alleluia is repeated by all, as indicated by the "Repet." The friars then sit while the two cantors sing the verse, joining in for eius at the end, as indicated again by the double bar before that word. As can be seen from "Non repet. Alleluia." the Alleluia is not repeated after the verse. So the Dominican practice is to repeat the Alleluia only once, before the verse. Originally we sang the Alleluia once more after the verse, as I will explain below. Another pair of cantors next joined the original two to sing, antiphonally, the Tract (Ps. 116). Then came the deacon's chanting of the Gospel from Matthew 28. The current use at the Alleluia reflects changes made in our liturgy at the time of Humbert's reforms in 1256. In the picture to the right you can see displayed one of the four extant Dominican Missals from before the Reforms of Humbert of Romans in 1256. This book represents the "Liturgy of the Four Friars" whose standardization of Dominican practice was approved in 1246. The left page shows the end of the Litany and the Vigil Mass of Easter (the right page is the Mass of Christmas). If you look carefully you can see where the rubrics for the Alleluia have been changed to conform to Humbert's revision: originally the Alleluia was sung a third time after the verse. This is here crossed out. The Tract was then sung in medio with two pairs of friars alternating the verses. At the Gospel only incense was used; no candles or cross were carried. There was no Credo and no Offertory chant. The Mass then continued as usual until the Pax Domini. Unlike the usual practice at Solemn Mass, the Pax instrument was not passed and there was no Agnus Dei. Rather, a very short vespers service began immediately after the response to the Pax Domini. The triple Alleluia antiphon was sung and followed by Psalm 116 with its Gloria Patri. After the choir repeated the antiphon, the cantor intoned the Magnificat Antiphon Vespere autem sabbati, which was also repeated after the choir had finished the Magnificat. The priest, who had by this time finished communion, then sang the Postcommunion Collect. The Mass ended in the usual way with the Placeat, the Ite Missa est, the blessing, and the Last Gospel, the deacon, however, sang the Ite with triple alleluias. Compline was sung after the evening meal with chants proper to the Easter season and the Salve Regina was followed by procession to the altar of the Virgin Mary singing the Litany of Loreto, was customary on all Saturdays of the year. In case you are wondering, Dominicans sing the Salve Regina all year round after Compline. There was no General Communion of the friars at the Vigil because the Easter General Communion was at the day Mass of Easter. But I understand that in many places a General Communion had been introduced into the Vigil in the early part of the twentieth century. Such as the practice at our House of Studies in the early 1950s. Perhaps the most interesting aspect of the Dominican Vigil is the absence of any rites related to Baptism and the font. This reflects the monastic origins of our rite: monasteries did not have pastoral cures and so had no baptismal font since they never needed to perform baptisms. The rite is also of interest for the simplicity of the Fire Ceremony, which is probably quite ancient. 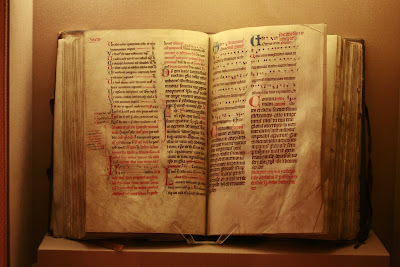 The Four Friars Missal show is Lausanne: Musee Historique MS MG 2117 and dates to the late 1240s. This post follows the rubrics of the 1933 Dominican Missal, the 1869 Caeremoniale juxta Ritum S. Ordinis Praedicatorum, and the memories of older friars of the Western Dominican Province, in particular Bro. Raymond Bertheaux.